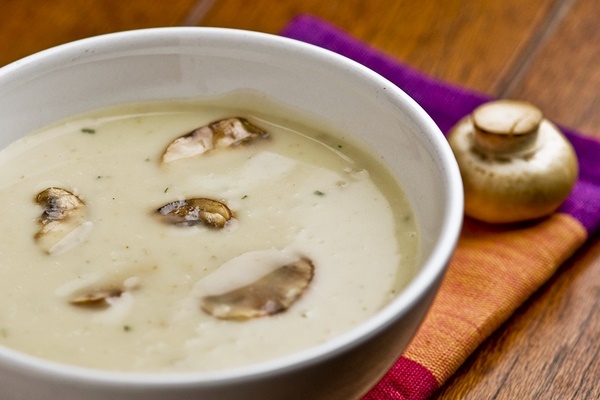 This wonderful dairy-free cream of mushroom soup is a “main course” recipe entry in the So Delicious Dairy Free 3-Course Recipe Contest, submitted by reader Kelie Escobar. To make it creamy, she uses everyday thickeners and Coconut Milk Beverage from So Delicious. This dairy-free cream of mushroom soup comes together in mere minutes. Note that the image above is stock photography, but it does depict the end result nicely. Sometimes we get recipe feedback via social media. 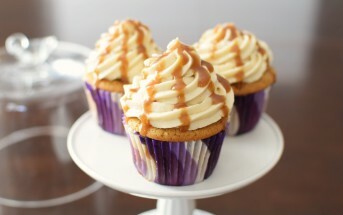 When I see it, I include it here with the recipe! 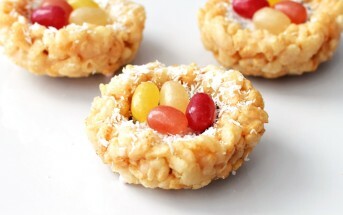 By ingredients, this recipe is dairy-free / non-dairy, egg-free, peanut-free, and tree nut-free. For a soy-free and dairy-free cream of mushroom soup, choose your margarine wisely. Brands such as Earth Balance have offerings that suit both dietary needs. 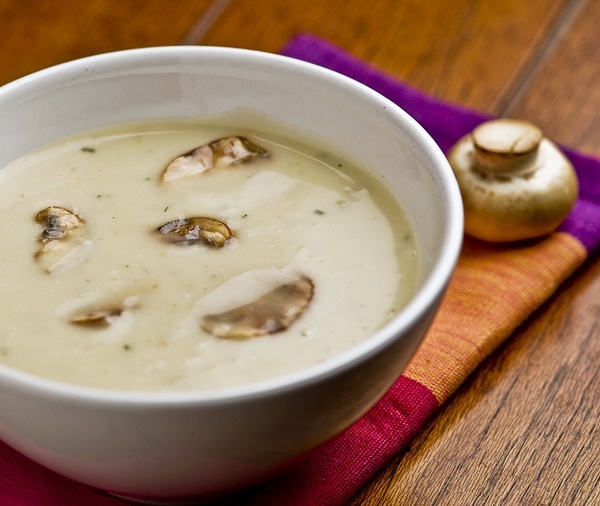 For vegan and vegetarian cream of mushroom soup, you can substitute no chicken broth or mushroom broth for the chicken broth. Both work as tasty alternatives. Dice mushrooms and onions and sauté in margarine until the onions are translucent and the mushrooms have shrunk in size and turned dark. Whisk in the flour until well incorporated, then add broth and coconut milk beverage. Bring to boil, whisking constantly until the mixture is thickened. Season with salt and pepper and serve. Can be used as a standalone soup for a meal or in other dishes. Very tasty and easy! How long will this soup recipe last? My mom, sister, and I are dairy free, and this recipe sound delicious. Can’t wait to make it! In the refrigerator, it will have about the same shelf life as most soups. I prefer to only recommend up to 2 days for food safety reasons, but I know many people keep them for longer. Since it has mushrooms – I wouldn’t personally do more than 3 days. It should freeze okay too. Can I use Almond flour instead of all-purpose flour? Almond flour might work well in this recipe, but you might need to adjust the amount. Can I ask how many cups this makes? Hmm, this isn’t my recipe, so I couldn’t say for sure Raini. It sounds like you might be trying to make a condensed cream of mushroom soup option for a recipe? If so, cook it down thicker and use the amount called for. This should make more than one cans-worth. I am so grateful for this recipe. I use gif flour and silk coconut milk. Best soup ever. Thank you to the author. Awesome! Thanks for your feedback Tracey. Can I use Silk Soy Milk instead of Coconut milk? I substituted almond milk for the coconut milk and gluten free all purpose flour to make the soup DF/GF. I also added fresh thyme to the soup. Delicious! Fantastic! Thanks for sharing your successful modifications Amy. What type of GF flour did you substitute? I have cassava flour. Do you think that would work? Rachel, I’ve never worked with cassava flour, so I don’t know how that would work out. Sweet white rice flour typically works well, and so does a gluten-free flour blend. If you can do nuts, I recommend grinding cashews (scant 1/4 cup or even a little less) into a powder, and using it in place of the flour. 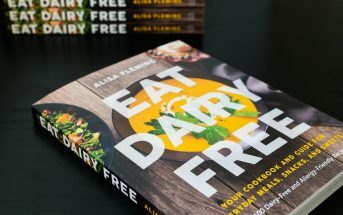 Yes, if you don’t need dairy-free, and are only lactose-free, then that should work for you. I subbed in brown rice flour for the flour to make this gluten-free as well. Also, I just used olive oil instead of butter. As long as you remember to salt and pepper it, it turns into a pretty decent soup blended or unblended. Thanks! That’s awesome Joelle. Glad you enjoyed and thanks for sharing your modification! I haven’t, but I bet it would work well. You’ll just want to use a touch more liquid. Would Vanilla Rice Dream work or not recommended? No, it would not work. This is a savory recipe so you do not want to include something sweet. 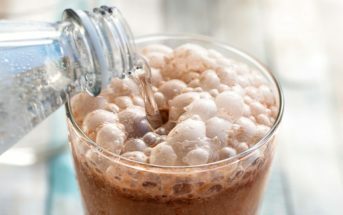 Could I use almond milk instead of cocunut? Yes, that should work fine Maria. Can this recipe work as a substitute for other recipes that call for cream of mushroom soup? I don’t believe it will work where “condensed” cream of soup is called for as this is a finished soup. If you have a copy of Go Dairy Free, the condensed cream of mushroom soup recipe in there works brilliantly. 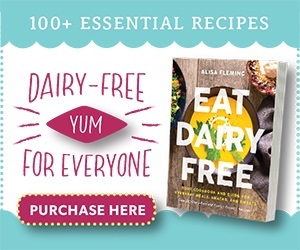 Hi… how can I obtain the Go Dairy Free that has the recipe for condensed cream of mushroom soup? 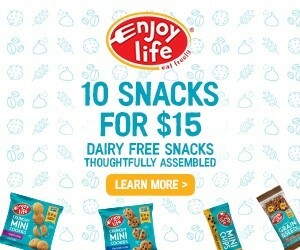 I have a Dairy free kiddo now and I am trying to adapt the holidays for her? Thanks! It’s sold via other online retailers, too! Page 182. It’s in the soup section. Enjoy! I’m using it in green bean casserole, instead of the condensed soup & milk it calls for on the “Crispy Fried Onions” container. Also saving those just for the top, since I was generous with garden onions in the saute. So far, so good. We’ll see as I’m mi-process on this. I hope it went well for you Carol!